Right off the bat, the commander in chief wanted to address the elephant in the room. No, not cyber security, but the incredibly “dishonest media”—a theme he would continuously reference throughout the speech. 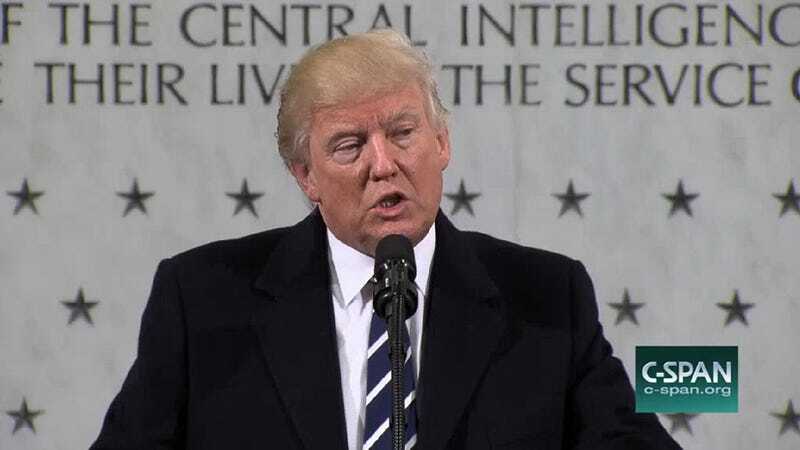 Standing in front of a wall that honors the 117 CIA officers who have been killed in the line of duty, Trump said that the press actually “treated him nicely” in its assessment of his speech yesterday. While many were probably expecting Trump to speak about his plans for the future of intelligence community’s cyber security operations, he seemed to want to talk about anything but that. By the way, Trump’s dismissal of the intelligence community’s findings in the Russian hacking investigation is the real elephant in the room. But Trump had other things he wanted to talk about instead. Trump informed the CIA crowd that we must stop “radical Islamic terrorism.” And Trump talked about how great and popular he is. 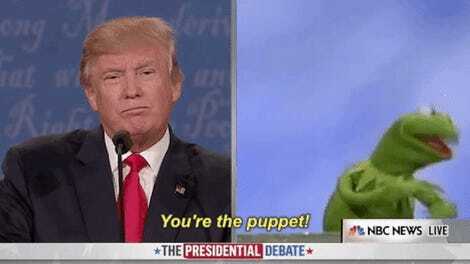 The president suggested that most of the people in the room probably voted for him. He said that we have to win, he also said that he feels really young, like he’s 30. Trump discussed the architecture of the room. He talked about his uncle who taught at MIT and smoothly segued from that to, “Trust me, I’m like a smart person.” This received a big laugh from the crowd. In general there was a warm reception in the room but it’s unclear if CIA staffers or Trump staffers were the ones cheering. Basically, it looks like Trump is still campaigning. The CIA has concluded that Russia hacked the DNC in an effort to help Trump get elected. But he has repeatedly refused to accept those conclusions as anything more than a partisan attempt to harm him with “fake news.” When an incendiary dossier of unverified intelligence that accuses him of being a compromised agent for Russia was published, Trump suggested that CIA Director John Brennan was responsible for the leak. If you didn’t know any of that and only saw this speech, you’d still be blissfully unaware. All the while, it’s clear that we have an issue with cyber security and it’s not being acknowledged. It looked honestly like a million and a half people, whatever it was, it was, but it went all the way back to the Washington Monument and I turn on, by mistake, I get this network, and it showed an empty field. Said we drew 250,000 people. Now, that’s not bad. But it’s a lie. We had 250,000 people. There has not been an official count of the crowd size yet, and it’s tough to find any outlet venturing a guess. Most have just stuck with side-by-side comparisons until a final number is determined. It’s probably safe to say that Trump’s brain truly thinks it saw 1.5 million people out there. Trump’s incoming press secretary Sean Spicer spent his first press conference focusing on inauguration attendance numbers, not the president’s policies or priorities. This suggests that the bombastic rhetoric from the Trump administration could just be a red herring, a distraction from the new president’s actual political efforts. Case in point, Trump has famously had a contentious relationship with the CIA over the last few months, and he’s done his best to discredit information that comes from the agency. His speech today was widely viewed as an attempt to reset his relationship with the intelligence community, rather than engage directly with it. Trump wrapped up by telling the gathered crowd, “I love you, I respect you, there’s nobody I respect more.” And then everyone went back to work investigating his ties to Russia.